This is no longer the official site for Living Stones Ministry. for updated information on Dana & her speaking ministry. This site still contains all of Dana’s Devotionals that she wrote when she used this site as her blog. Please Contact Dana through her new site if you are interested in her speaking to your woman’s group. 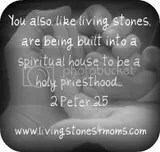 Hey, I just saw the link to the Living Stones blog on your family blog, Dana! How exciting! I was sad to miss the conference last year, so perhaps I can glean some wisdom from the blog. What a beautiful family you have. I am thankful for your very encouraging articles. Mom’s have such a significant role to play in the lives of their children. When they are being drained daily, it is wonderful to have blogs like yours to fill themselves up–spiritually and emotionally—and to know they are not alone. God’s grace to you as you continue to walk this road with Him. I am just beginning to write on my own blog, but between writing on other projects, taking care of my family and life, I am quite slow at getting new material. It is godowndancing.blogspot.com if you ever want to visit. Many blessings to you! Thank you for your willingness to obey God in this whole adventure–both the mothering part and the ministry part. I have also recently surrendered to God’s call to encourage women, especially mothers. I am scared to death to even own to it yet–as I still have very young children and massive doubts about what I have to offer anyone. Yet as I obey each day and see Him work in women’s lives, it is slowly sinking in that it is WHAT HE HAS TO SAY, not me. So I am committed to obey. It takes some courage and faith to do what you’re doing, and I am encouraged further by seeing your site–both in my mothering and in ministry. Thank you! Thanks again for your website. I just had time to read about finding time for God in your busy day. What a blessing! You get it!! Now I have no excuse!! :) Anyway, thank you for sharing your heart so openly. I think this is the only true way God can use us and our lives to minister to others. I have struggled with depression since Patrick was a baby and I totally agree with you about Satan using that to pull us far away from God. I praise God that His power in us is victorious over the lies of Satan. Choices-you are so right. Everyday, every minute, I have the choice to listen and give in to those lies, or submit to His best choice and relish in his comfort and love. I would be interested in any other articles or writings you have done on depression or along those lines. Again, thank you for following God’s tugging on your heart. He has used your words today to really comfort me. Share my button on your site. Do You Have Questions About God? Click Here!